The Banggai cardinalfish, Pterapogon kauderni, is a fascinating species that possesses a series of remarkable biological characteristics making it unique among coral reef fishes. It has been the focus of studies in reproduction, ecology, population genetics and evolution. In addition, since its rediscovery in the late 1990s, it has become tremendously popular in the international ornamental fish trade, and indiscriminate collecting has led to its inclusion in the 2007 IUCN Red List as an endangered species. This book is divided into three main parts: a general introduction to the fish, including a historical synopsis with an overview of the Banggai Archipelago; a comprehensive treatment of the species natural history (distribution, morphology, reproduction, embryology, ecology, genetics, systematics and evolution); an account of the conservation of the species, including descriptions of its fishery, attempts to protect it under CITES, and introduction programmes. The book also includes an appendix offering information on captive breeding, juvenile mortality reduction, and common diseases. This book is a unique resource for ichthyology students and researchers working on fish biology, ecology and conservation, and for marine ornamental fish hobbyists and aquarium professionals. 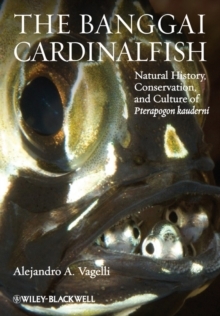 Visit www.wiley.com/go/vagelli/cardinalfish to access the figures and tables from the book.